With only a handful of ingredients and minimal effort you can charm your family and friends with a nutritious and satisfying holiday dessert that can double as an energizing breakfast. Prepare persimmon cream by placing persimmons, hemp seeds, cinnamon and vanilla seeds in a blender, and blending on high until the mixture reaches a very smooth thick cream consistency. Core the apples with an apple corer, and cut them into disks. 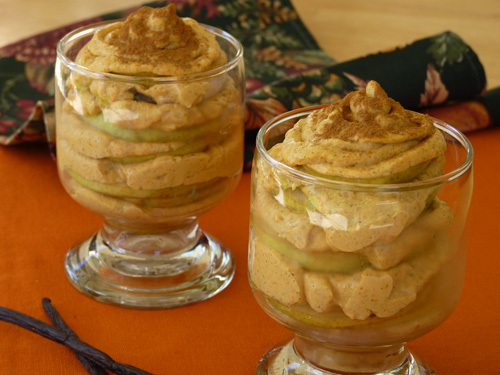 Layer the apple disks and persimmon cream in a glass, sprinkle the top with cinnamon and serve.